World Women Chess Championship day 5 LIVE! After the drama at the round 1 tiebreaks yesterday and the surprising results yesterday, we continue our live coverage on Chessdom.com directly from the playing hall in Nalchik. Yesterday’s results were 4 wins for white, 2 for black, and many many draws. Together with the LIVE coverage from Nalchik, today we will follow the Final Masters in Bilbao. The game Aronian – Carlsen with commentary by GM Dimitrov. Photos from the opening ceremony are available here. 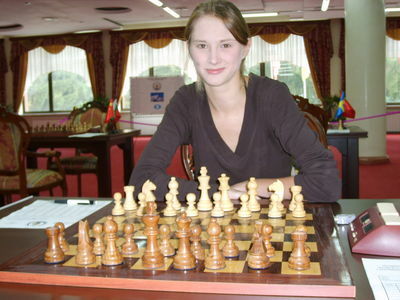 Yesterday, some of the players played their first games from the World Women Chess Championship. One of them is Claudia Amura. After the round she gave an extensive press conference, which was a mix of Spanish, English, and Russian talk. “When the conflict started, I started thinking to come or not to come. But then I saw all the professional work done by the people here, and I thought that it is not fair not to come.” Later on you will be able to read a full transcript of the interview. All the photos from yesterday’s round are available at the Day 4 photo gallery. The news archive from August is available as well. On being asked what was their first thought after learning that WWCC will take place in Nalchik? Lufei Ruan: I looked at the map and at first felt slightly worried, but once I arrived here, I realized it was the best place for the Championship. Lufei and Claudia were asked to comment on the game they played against each other. Lufei Ruan: It was a very complicated game, there were some chances to play for a win, but as the time trouble was approaching I made some inaccuracies and the game ended in a draw. Claudia Amura: We both made some mistakes, but it was an interesting game, completely different from something that men would play. From the FIDE Nalchik website we read: If the question of the first round was whether the favorites would lose at least half a point, now, in the second round there was the most pertinacious struggle on almost every board. There are no clearly weak chess players left. Under certain circumstances almost every player can advance rather far along the fixture list. Now every move is decisive. That completely fits the description and the multiple questions at the 12:00 update. Half an hour is left to the games and the tension is growing. Expect the photos from the round immediately after its start. On 13th September is rest day and there will be excursion to Elbrus mountain, which has the highest peak in the Europe. There people can ski in t-shirts with short sleeves! Expect many photos from the top of Europe as well, in the photo gallery of Chessdom.com! And the moves are flying! Games started and the players are already cruising through the opening. The first photos will be available in a few minutes. The Kosintseva sisters were the first to arrive at the playing hall. Obviously charged with desire to play, they are both moving at fast pace against Cmilyte and Zatonskih. Again only one game opened with 1. Nf3 (the rest are e4 and d4). This was the move with white for Mkrtchian. Zatonskih seems to have surprised Kosintseva, as the Russian player is spending more time on the opening now. Outside of the playing hall GM Vladimir Georgiev, the coach of Antoaneta Stefanova, is in front of the monitors following the games. The access to the playing hall is forbidden, as during every round, due to anti cheating measures. While the games are in the opening, there are some interesting news around the Dresden 2008 chess Olympiad. Stay tuned while we are posting the info. Several teams have been added to the Chess Olympiad in Dresden teams list. Canada will be represented by IM Nikolay Noritsyn, GM Mark Bluvshtein, GM Pascal Charbonneau, IM Igor Zugic, Thomas Roussel-Roozmon (info by chess.ca). Namibia and Kenia have been added as well. This information is just an introduction to the breaking news, first here on Chessdom.com. 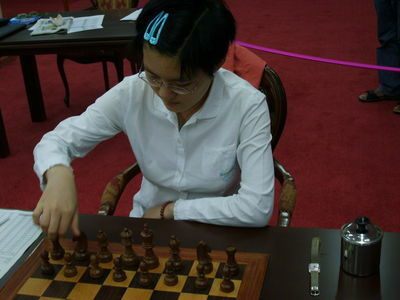 The Chinese women team for Dresden 2008 will be composed of Hou Yifan, Zhao Xue, Shen Yang, Tan Zhongyi, and either Xu Yuhua or Ju Wenjun. This means ALL of the participants are from the World Women Chess Championship in Nalchik. The fastest moving player until now is Anna Zatonskih. She has 1 hour and 19 minutes on the clock. On the other hand Elena Sedina has 48 minutes left. On a question from our readers, here are the confirmed players from the WWCC in Nalchik that will participate in the Chess Olympiad in Dresden 2008. Lilit Mkrtchian, Hou Yifan, Elisabeth Paehtz, Ketino Kachiani-Gersinska, Zhao Xue, Shen Yang, Anzel Solomons, Pia Cramling, Tan Zhongyi, Xu Yuhua, Ju Wenjun, Katerina Rohonyan, and Anna Zatonskih. Anna Ushenina is heading towards time trouble early in the game against Paehtz. On move 10 she has 34 minutes. Humpy Koneru said that her next tournament will be ECC in Kallithea where she will be playing for Monaco again. They will try to defend the last year’s title. She was in Greece only once, when she won 2001 World Junior Championship, so she has good memories about the country. She was supposed to visit Chegem waterfalls this morning, but the excursion is delayed for some other day. Here are some photos from the start of the round by the official photographers, more can be found on the official site. Wenjun Ju and Stefanova are playing an important game today. 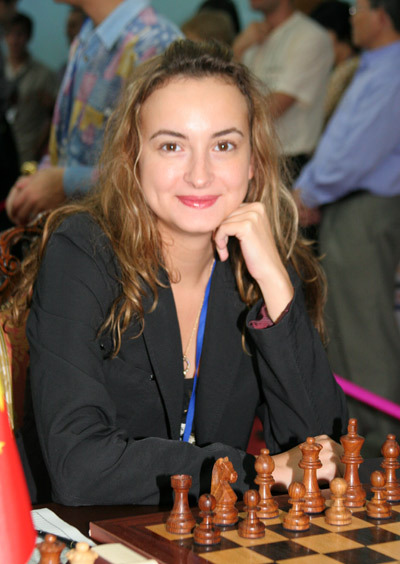 Yesterday the Chinese player managed to hold Stefanova to a draw. Today, Stefanova will be looking for a victory in order to have a rest day tomorrow, but her opponent will surely do the same. Currently Ju has 39 minutes, Stefanova 59, and they are at move 14. Only 19 minutes for 21 moves for Ju! Anna Gasik has 16 minutes for 17 moves, and Anna Ushenina 19 for 23 moves. Serious time trouble ahead for those players. It is much worse, hoeever, for Elena Sedina, who has to make 20 moves for 5 minutes. Elena Sedina is down to 2 minutes at move 23! Sedina and Nguyen signed a draw! This means we have our first round 2 tiebreak after two consecutive draws. Now Inna Gaponenko is in deep time trouble with 4 minutes for 23 moves against Rohonyan. Mkrtchian is through after a 1,5/0,5 victory vs Anna Gasik. Shen Yang is through after surviving a difficult time trouble. She reached the time control with only 1 minute on her clock and they agreed to a draw with Zho Xue due to the opposite c0lor bishops. Yesterday Shen Yang won and the total score is 1,5/0,5. Ruan Lufei qualifies! A surprising draw with white in the first game, and an even more surprising win with black give her the pass to the next round. CLaudia Amura has to go back to Argentina, but she played quite well in her first game and we will surely see her at other top women competitions. Yifan Hou gives no chance to Mongontuul and advances to the next round with total score 2-0. 15 minutes are left to the start of the live game Aronian – Carlsen from the final masters in Bilbao. Pia Cramling wins! She is through with a score 1,5/0,5. Nadezhda Kosintseva and Viktoria Cmilyte draw! Another round 2 tiebreak! Harika and Muzychuk draw! Harika shared with the Chessdom.com journalists that was fairly balanced through the game and at the end she sacrificed two pawns, 46…f4 and 48…g3, to activate her King. The Rook ending ultimately concluded in a draw. She never played tiebreaks before, not even many rapid events, but she is hoping to do well. Hoang Thanh Trang and Anna Ushenia go on with result 1,5/0,5. Good play by Paehtz and Socko. Zatonskih – Kosintseva draw, and Kosintseva goes on with total score 1,5/0,5. Zatonskih could not qualify, yet the USA will have their representative Rohonyan play tiebreaks after a victory against Goponenko. Stefanova and Ju go to tiebraks as well! A draw was signed in their game. Xu Yuhua is out! 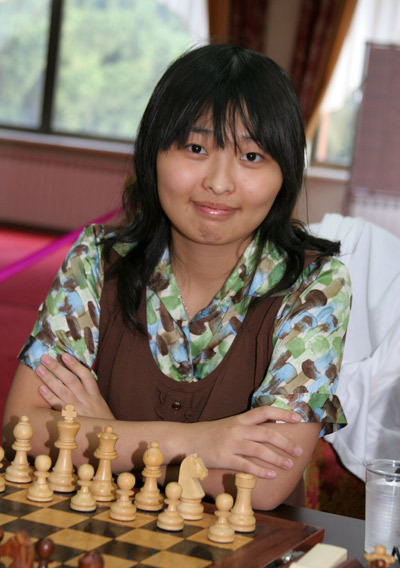 Svetlana Mateeva eliminated Xu Yuhua and will play in the third round of the World Women Chess Championship! Thank you for following Chessdom.com live coverage of the World Women Chess Championship! See you again tomorrow at 7:00 EST/13:00 CET.